هتل آپارتمان پتروبروس را به صورت آنلاین رزرو کنید! * The Petrou Bros Hotel Apartments offers 52 apartments located on three floors, all of which have bright, modern decor and extend to balconies and kitchenettes. Amenities include air conditioning, wireless Internet access, satellite television, direct-dial phones, hair dryers (on request), and safes. * The modern Petrou Bros Hotel Apartments offers breakfast services, and complimentary onsite parking. The hotel staff can offer assistance with sightseeing, diving excursions, and car rental, and further amenities include laundry facilities and a 24-hour front desk. * Guests can also enjoy complimentary use of the Larnaca Tennis Courts, 800 metres from the hotel. 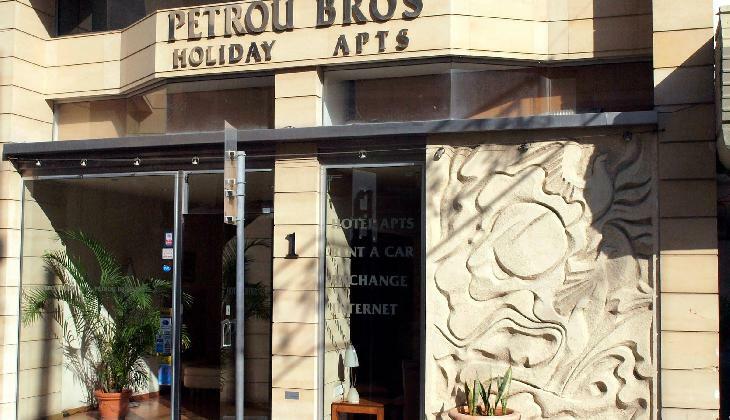 Petrou Bros Hotel Apts is a modern, family run complex providing comfortable accommodation at reasonable prices. These apartments are easily accessible to all amenities - only 2 minutes walk from the long sandy beach, many restaurants and bars that stretch along Larnaca's impressive seafront. It provides an ideal base to explore this beautiful island, rich in history and culture, renowned for its genuine hospitality and endless sunny days. Only 10 minutes drive from Larnaca International Airport, conveniently located in the heart of Larnaca. Hotel is easily accessible to all amenities - only 2 minutes walk from the long sandy beach, many restaurants and bars that stretch along Larnaca's impressive seafront.